Mount St. Helens, the stupid volcano that reminds me every year of my age. 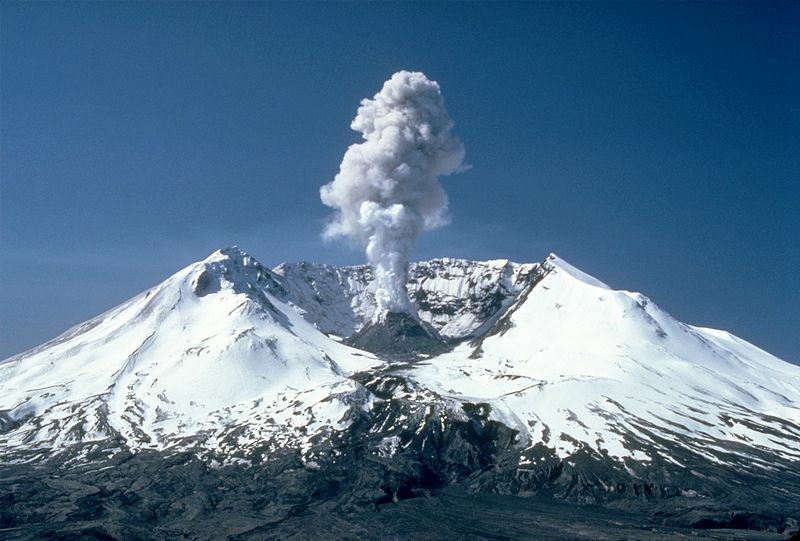 The papers today published reports about the event and stated the obvious that Mount St. Helen’s is now the most studied volcano in the continental US. Ya think? It’s like saying the only book on a bookshelf is the most read book in the house. Tales of nature’s fury and recovery, stories of people who lost homes, and blurbs from those who lived in the area will be filling up valuable news time and blog space all week. It can’t be thirty-four years. I was seven years old when that thing decided to blow. I remember my dad and I walking a couple blocks from our house to watch the ash spewing from some mountain I’d never noticed before. I remember wearing facemasks for weeks after until the dust settled. I remember the coating of ash all over cars, plants, pets, and, well, everything. Thirty-four years have not passed since I made fun of people buying little vials of “Real Mount St. Helen’s Ash” from local gift shops. Really? We had a half-inch layer of the stuff all over our rhododendrons and these people were paying $5 for it? Even as a child I was cynical enough to call these people fools! I know people that weren’t even alive thirty-four years ago. I cannot be forty-one. That’s insane. I am so NOT forty-one. I don’t act forty-one – okay I don’t really know how forty-one year olds are supposed to act, but it seems they should be much more serious about things than I am, have a herd of kids, attend parent-teacher conferences, know what they want to be when they grow up or at least be settled into a career, that sort of thing. A few years ago Iceland had its own volcano (I’m not going to try to spell that glob of syllables) spouting. I’m thinking of thirty-four years from now when I’ll have to hear stories of it and how it disrupted flights across Europe. And I wonder what all the girls who are kids now will have going through their heads when they realize they’re forty-one. By then it will be sixty-four years since Mount St Helens went off and I’m sure the papers here will still be running the same news stories they always do about it. And I’m sure I’ll be saying, “I am totally NOT seventy-one.” Maybe by then I’ll be acting and looking more my age. You are too funny, but I agree that you definitely don’t look 41! I hit 30 last year and I compare myself to other people my age in terms of “success” – I do not measure up to my own standards! But hey, I’m over it, I’m doing my best and moving forward so I can’t ask for much more! Exactly! Still, if I hear of another 16 yr old becoming a best selling writer, I may jump into the volcano. I was 32 and living in Yakima, just 85 miles downwind. We were buried in inches of ash and noontime turned pitch black. It was terrifying. The mountain wasn’t the only thing blowing up in my life, either. It was a long trip from that Eden in the desert to New England. It’s always interesting to see what memories certain events trigger in people. Thanks for commenting…I always love hearing from readers.